If you're taking a Tell Tale trip, but would to relax on one of Thailand's beautiful beaches afterwards, why not add a few days or even a week at a beach resort? We have handselected (literally) a few resorts throughout Thailand so that there will be one convenient for the location where you end your Tell Tale trip and/or best for sunshine at the time of year. If you are new to Tell Tale Travel, please note that our beach extension service is for those taking a Tell Tale itinerary in Thailand, we are not the people to come to if you're looking for a two week 'fly and flop' holiday! Tell Tale Tip This page is extensions at beach resorts only, if you're looking for a beach-based Tell Tale trip, do have a look at Action on Shore or Reefs, Rays and Lagoons which can be taken by couples or families. 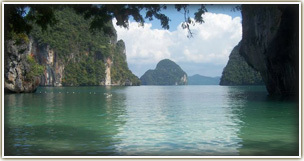 Krabi, jewel of the Andaman Sea. Have a look at our recommended hotels. A small island of 9 bays and a micro-climate, easy to get back to Bangkok airport by boat and car/minivan, no planes necessary! Touristy for us, but can sometimes suit.